The land of the 1000 rivers, as Galicia is known, certainly lives up to its name. They cross the whole region from the mountainous interior all the way up to the coast, where they form the characteristic “rias”, with their mix of fresh and salt water. One of the outcomes is a coast of great contrasts, which takes in magnificent beaches, pretty fishing villages and dangerous cliffs, such as the Costa de La Muerte – the coast of death, no less! Inland there are some impressive towns to be found, not least the world heritage city of Santiago de Compostela, as well as romantic villages and lush green landscapes. It is a region proud of its Celtic heritage and culture as well as its unique language – Galego, which is more similar to Portuguese than Spanish. But then, in many ways, Galicia has always been a singular region. 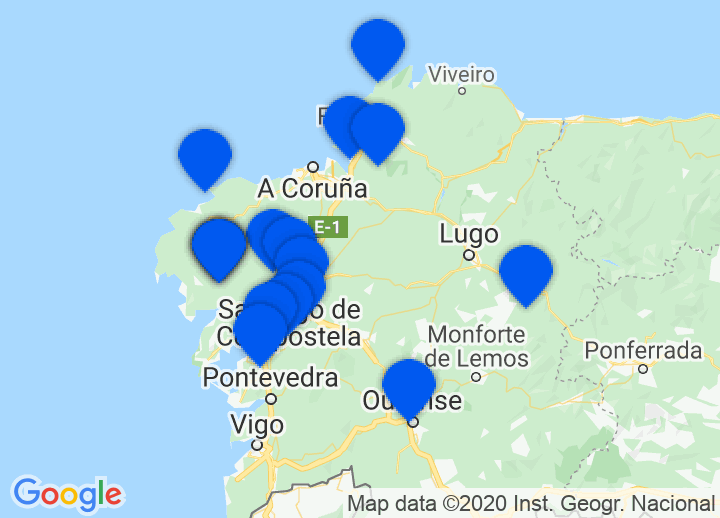 Choose from our unique selection of romantic hotels in Galicia, including romantic La Coruña hotels, bed & breakfasts, Santiago de Compostela hotels amongst others. Whatever your taste, we’ll help you find that perfect getaway in Galicia. A visit to the World Heritage city of Santiago de Compostela is a must. This beautiful and friendly city possesses one of the finest buildings in Iberia, the Cathedral of St. James. A wonder around the city, taking in the monuments and ”tapa bars” is an excellent way to while away the day. The Route of Santiago, which finishes here, is in fact, the longest-established “tourism” route in Europe and many people make all, or part of it, on foot or bicycle. This is a great way to get to know the land. Galicia is also a good excellent base from which to enter northern Portugal. The gastronomy of Galicia is varied, and there is no one single dish that typifies its cuisine. The same product can be cooked in a multitude of ways, each having its own distinctive flavour. It can be generally characterised, however, by a generous combination of simplicity and use of natural products. The seafood of Galicia is considered to be amongst the best in the world, because of the rich plankton around its shore, so visitors are recommended to try it at the first opportunity. Other interesting dishes include the pote (potage made with ham bones, haricot beans and, depending on the chef, turnip tops), the caldeiradas (similar to bouillabaisse, but served in two parts: first the broth and only then, the fish), pulpo (octopus), dairy products and pastries. As for a tipple, the famous Alvariño green wine is certainly recommended, particularly with the delicious seafood.